At first we both laughed and then we dove into what that really meant and the painful truth behind that statement. Typically, when a client wants to manifest something that they haven’t been able to get – like a new juicy partner – we look at the limiting beliefs that lurk beneath the surface. I talk a lot about the messages we received from our parents, our teachers, our religion, our cultures, that continue to run our decisions but Disney… this is a big one. Ladies (and gentlemen) take a breath and let’s dive in! Along came Mr. Right. He had all the greatest of qualities. Their eyes met and their hearts skipped a beat. He was loving, sweet, present, available, strong and willing to show up in all the ways that matter. But then…(cue in scary music) something happened. What? Not the ride on horseback into the sunset? What? The Prince didn’t give his whole life to her? What? The Prince snored and even worse, he didn’t remember to bring her home flowers and shower her with his riches? What? He would rather watch football and not go shopping on Sundays? Maybe she needed to dump the “prince” and look for her REAL prince. NOT! What seemed like the fairytale story became nightmare on Elm St. What appeared to be the perfect fit began to fall apart at the seams. The old unhealed wiring from the past showed up and the pretty picture Disney painted caused great conflict. And the thoughts of how things “should be” kicked in, and what was supposed to be a romance and dream come true fantasy became a heavy drama filled with tears, pain and loss. You also see a princess in a flowing gown, and sparkly, and thin and quite often weak and disempowered. You see the prince appearing tall, handsome, wealthy, strong and in control. We got Disney messages of what we should be like, look like and want in a partner…and it was not based on real life circumstances. Disney set us up to look a certain way and to search for the dream. That’s not a bad thing…to dream. But we need to get real and allow the human experience to show up too. You need to track the uncomfortable feelings that have you feeling unlovable the way you are. If you don’t look like the ideal/unrealistic princess, are you not allowed love? Are you not beautiful? Will you keep your heart hidden because you fear your prince will judge you or worse find a better, prettier, princess? Might you be perfect just as you are but are seeing through the eyes of Disney? I still grapple with this. I think I’m awesome and any man that is invited into my life is beyond lucky BUT I still have moments – present man included – where I compare myself to his past princesses, his future princess encounters and that can get me into my fear about my enoughness… am I pretty enough, smart enough, thin enough, funny enough bla bla bla. It’s maddening but luckily I spot it quickly and have my shadow work tools to bring me home to the truth of who I am and get back on track. I used to really sabotage the crap out of my relationships. When I felt scared, I acted in such unhealthy ways and it had a big cost. If I find myself in the past or the future, I bring myself back to the here and now so I don’t miss the present. I certainly will not show up fully for the loving, beautiful, real man that wants to be in my life if I am not present. Staying awake and loving myself is a total game changer. Disney did NOT teach us that! But what if he finds out I’m not perfect like Cinderella? Will he abandon me and continue his search for his perfect fairytale girl? What if he discovers I am not as strong as Elsa from Frozen and that I still have some shadows that pop up? Will he still love me if I show my vulnerable self? My powerful self? My imperfect self? And so we come to the most important part of the story…how to have the happily ever after. It’s not about finding the Perfect Prince or being the Perfect Princess but to embrace all of who you are and loving your whole package. By looking at your fears and how you sabotage your relationships, you can then heal. 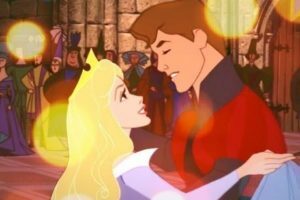 By owning your truth and not comparing yourself to other princesses and allowing your inner empowered, vulnerable princess to be loved just as you are, you will feel happy inside whether or not your prince stays or goes. The alternative is living in fear and not fully allowing love in. I choose to live as vulnerably as I can so I can feel love beyond my wildest dreams and to me, that’s an awesome happily ever after. So ask yourself, what is it you are calling into your life? What has to happen to get it? Are you setting yourself up where you won’t go for your wants because you feel scared, small or undeserving? Where did those thoughts come from and are they true? Disney opened our hearts and brought us on very special journeys but they were stories not based on reality. I invite you to look into the mirror and ask your mirror NOT who is the fairest of them all but who are you truly? Let yourself see your beauty and not compare it to others. You shine your unique divine light and if that mirror offers unkind words of judgment or anything other than loving support, there are some shadows lurking or some unhealed past messages you’ve picked up and it’s time to clean off that mirror and embrace all of yourself…all your parts. May you enjoy your dreams and even your fantasies AND allow the reality of being an imperfect human totally deserving a happily ever after. FYI, I have a new workshop November 13th called: Loving The Whole Package for Women. It will be held at the Center for Spiritual Living in Caldwell, NJ. They are just getting the registration set up so if you have any interest in loving your whole self…all your parts, pencil it in now and more details will follow! It is $25 for early registration and it goes from 1-[3:30]. ← Junie, what do you see?